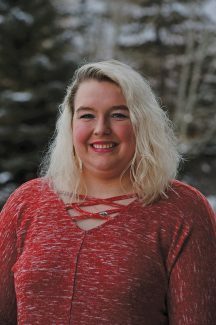 Mackenzie Hicks is a copy editor and page designer for the Steamboat Pilot & Today. She graduated with a bachelor’s degree in journalism from the Harvard of the South, better known as the University of Mississippi. She was the copy chief at the college-run newspaper The Daily Mississippian, where she cultivated her skills in editing and research. In college, Mackenzie studied design, which also aids in her job as a page designer. After briefly working in Dallas, where she learned social media skills, she came to Steamboat Springs. Mackenzie also uses her social media training to curate photos for Instagram and her love of research to compile the weekly real estate transactions report. In addition to editing, Mackenzie enjoys reading and writing. She also loves spending time outdoors hiking with her two dogs.